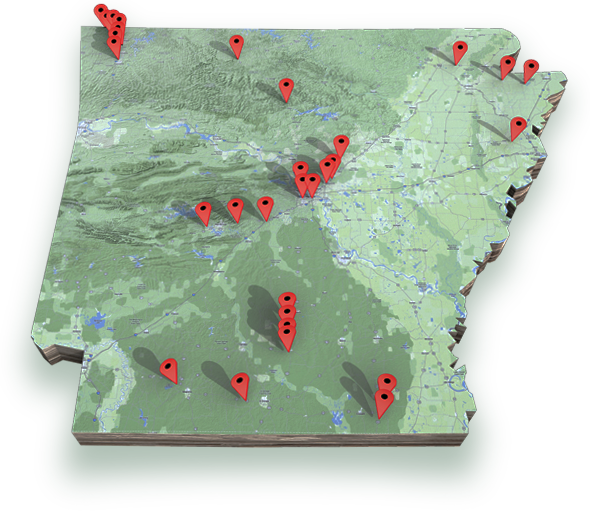 As the Connecting Arkansas Program continues to progress, this page will serve as your informational center for the latest meeting announcements, news releases and lane closures. Be sure to visit again soon for updates. The purpose of this project is to widen 5.4 miles of Interstate 30 to six lanes, reconstruct three interchanges, and replace five bridge structures between U.S. Highway 70 and Sevier Street in Benton. Construction contractor Manhattan Road & Bridge estimated that it would take 96 days to replace the bridge, resulting in a late October completion. However, crews worked hard to reopen the bridge 23 days early. The public hearing will present the proposed preferred alternative, the 6-Lane with Collector/Distributor (C/D) Lanes with Split Diamond Interchange (SDI) at the Highway 10 interchange. The public is invited to visit any time during the scheduled hours to view exhibits, ask questions, and offer comments. This will be an "open house" meeting with no formal presentations. The public is invited to visit any time during the scheduled hours to view exhibits, ask questions, and offer comments. The Arkansas Highway and Transportation Department (AHTD) will conduct two educational public meetings on how to navigate the interim modified connector roundabout for Highways 71, 71B, and 549. Public involvement meeting to present and discuss the proposed widening of Highway 82 between Airport Drive and Highway 82B in Union County. Crews will reduce westbound traffic to one open lane from Rodney Parham Road to Baptist Health Drive.